Dina Merrell joined the CBF in October 2004 as Associate Director. In her role, Dina oversees and directs the CBF’s grants program and other programmatic work, including court-based efforts and immigration partnerships. In addition, she oversees the administrative operations of the CBF, with a lead role in directing finance and audit, human resources and other key operational activities. Prior to joining the CBF, Dina served as Director of the American Bar Association Center for Pro Bono and as Counsel to the ABA Commission on Loan Repayment and Forgiveness. 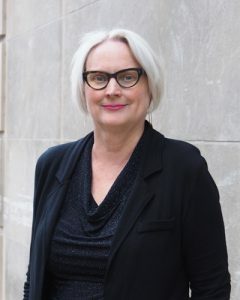 Earlier in her career, she served as Special Counsel to the Guardian of the Illinois Department of Children and Family Services and as a Staff Attorney at Cook County Legal Assistance Foundation. Dina is active in Chicago’s nonprofit community and has served in many volunteer leadership roles, including on numerous committees and work groups focused on access to justice, immigration and grantmaking. She currently serves on the Board of Directors of Grantmakers Concerned with Immigrants & Refugees (GCIR), a national organization that mobilizes philanthropic support for immigrants and refugees. Locally, she is Board Secretary of Links Hall, an organization that incubates and supports artistic innovation. In 2005, Dina was selected as one of the “40 Illinois Attorneys Under 40 to Watch” by Law Bulletin Publishing Company. Dina graduated with honors from Chicago-Kent College of Law, which awarded her its Distinguished Service Award in 2008, and earned a B.S. from Miami University (Oxford, Ohio). She resides in Chicago.